Tottenham Hotspur manager Mauricio Pochettino voiced his frustration on Friday that Belgium coach Roberto Martinez announced defender Jan Vertonghen would be injured until late November without telling the Premier League club first. Vertonghen injured his hamstring in the 2-0 win at Huddersfield Town last week and was expected to return, along with several other first team players, later this month. However, Belgium boss Martinez announced his squad on Friday for upcoming matches and said that the 31-year-old would miss the international break in November, also. Pochettino, preparing his side for the visit of Cardiff City in the league on Saturday, was not happy that there was no communication from the Belgium camp on their diagnosis of his player. "The communication is so difficult with all the national teams. Before my press conference, you knew about Vertonghen (being injured), because Roberto told the media," the Argentine told a news conference on Friday. "They need to call us. If they call us, we are more than open to talk and give our opinion but if they don't call... The natural thing is, if they have some doubt, call us. "The player is here every day, our show is day by day. For them it is every month and they have more time than us. I don't want to create a problem, but the normal behaviour is the national team calls you." A prolonged absence for Spurs' defensive stalwart could not come at worse time for the club, with their Champions League hopes in the balance after their 4-2 defeat by Barcelona at home on Wednesday, their second loss in Group B. After this month's international break, the games come thick and fast for Pochettino's men with an away trip to PSV Eindhoven followed by the visit of Manchester City just two days before a League Cup trip to West Ham United. Spurs could give themselves a timely boost, then, with a third successive league victory on Saturday. 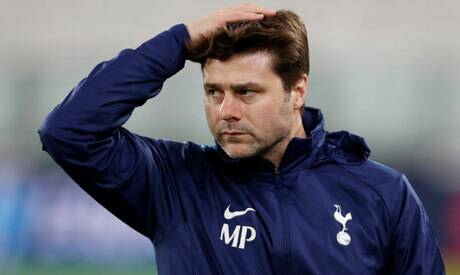 However, despite being heavy favourites on paper to beat a Cardiff side without a win so far this campaign, Pochettino urged his side not to get complacent at Wembley and show the same motivation that led them to almost be a match for Barca. "I think with full respect to Cardiff it will be a tough game too. In the Premier League there are no easy games," he said. "Everyone can think the motivation to play against Barcelona (is huge) and it looks like we are going to play Saturday and it will be an easy game. For me it's the opposite. The most difficult game is the game that everyone outside of the team believes that you must win. "For us it's so important to be motivated in the same level. If not, we are going to struggle. There are a lot of examples in football when you don't respect the opponent." Along with Vertonghen, Dele Alli (hamstring), Serge Aurier (thigh), Mousa Dembele (thigh) and Christian Eriksen (abdomen) all remain sidelined. Spurs have not lost to Cardiff in all competitions in more than 40 years, since a 1-0 defeat in the FA Cup in January 1977.